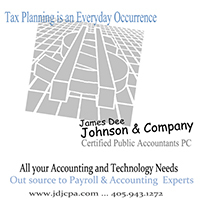 Tax Planning and Projections - Tax planning is an everyday occurrence and with James Dee Johnson & Company, you will find comfort knowing that financial knowledge of the most current tax laws affecting business are always current and practiced. Business and Personal Tax Preparation - James Dee Johnson & Company prepares federal, state, and local tax returns for individuals, corporations, partnerships, estates, trusts, and LLC's. E-Filing - Our firm has the ability to e-file federal and state quarterly reports, tax payments and tax returns. Software Support - We support various business accounting software. Internet-Based Accounting - Our firm gives you the ability to access your accounting data, prior year tax returns and current tax documents on our secured NetClient Portal.